On June 30th, Capital Games released the Geonosian Spy in Star Wars: Galaxy of Heroes as a Aurodium Pack replacing B2. The Geonosian Spy is an attacker class character who’s gimmick is a powerful attack — IF you set it up properly, and extra TM when other Geonosians land a negative status effect. For the curious, we posted an unboxing video showing the obtaining, staring, gearing and leveling of the Spy. He appears to be a cheaper character than previous aurodiums costing me personally around 22k crystals or about $143 US. That’s $100 cheaper than B2. Others are reporting ranges 16k-25k ranges. This is a first look at a character who is not at his gear max and has JUST been introduced to the game. It is a first impression based on very limited game-play, data, and ability to see final gear level performance. Please pay very close attention to the comments section as others will likely have differing data and opinions which will compliment this review. Our Geonosian Spy in Star Wars: Galaxy of Heroes is gear 9, needing a fusion furnace and a security scanner to progress to his final gear level of 10 (He required one fusion furnace to get to gear 9). Our Geonosian Spy has level 7 abilities with no omegas and because he is not at his gear max this is a PREVIEW only. That extra gear level will buy him a little more health and protection than he has now, and as you can see in the videos he will need every shred. The Geonosian Spy in Star Wars: Galaxy of Heroes is a Geonosian horde character with Stealth and high Critical Damage capability. So lets just jump straight into Arena. Geonosian Spy has two things that make him strong in Star Wars: Galaxy of Heroes — other Geonosians who do debuffs (Poggle and Sun Fac) and stealth. So we ran him in a Geonosian Team with RG (which Geonosian Spy really needs). Note our soldier is only G9 and with no omegas. Sun Fac is gear max with no omegas, Poggle is gear max with no omegas. As you can see, it was a disaster. While we didn’t expect to pull out a victory against the arena super-max team we were honestly surprised at how little of a contest it was. Next we removed the RG, moved Poggle out of lead and dropped in a Teebo on the theory that the AI would stop using Geonosian Spy’s special to apply evasion down and he’d get the offensive boost of maybe being in stealth because of Teebo. But again, this was a disaster. Finally, we replaced Anakin in our Hybrid team with Geonosian Spy (moving Rex back into the lead) and pulled out three victories. But as you can see Geonosian Spy’s performance while respectable still didn’t offset his low health liability and a human opponent would have long since dispatched him. In Arena in Star Wars: Galaxy of Heroes we’re giving Geonosian Spy an overall 2 based on his low health and protection, his low basic 2-4k damage (which he will be using most often) and the sheer difficulty of setting up his special attack which, realistically, will rarely break 10k damage. This rating may change if a better synergy is found. We should add, his seemingly low chance to go into stealth as well, which could just be unfortunate RNG. We tried to do a video of Geonosian Spy in the attacker challenge but our team was a bit too powerful to show off the potential here. Lets just say using Geonosian Spy will make the challenge go slower if you try and set up his special, with the added bonus risk of removing all the restraining debuffs on Tarkin and Veers and the chance of seeing your team die in a fiery blaze. You might use him on the challenges where you bring along an ally but somehow we doubt it. Darkside has a lot of good attackers on it so there’s really no need to bring Geonosian Spy along. There’s no special niche he serves. Here he gets a score of 2 from me but only for his slight potential to be useful on some mission or another that we can’t really think of. Use him in challenges at your own risk (muhahahaha). In a raid, in phase one he might be useful since buffs and debuffs abound so you might actually get his special set up and maybe one shot a guard. More likely, because of his low health and protection he will be dead. Even more likely still, your turn meter group will be geared and leveled up and soloing the raid before you get him geared up. We think we can part with a 4 here, though we suspect he is trash team fodder only. Low health, low protection, no real survival skills is not a good mix. Well we take that back. If you pair him with Phasma so he is guaranteed a crit and can enter stealth, he will probably live. Against the AI, under human control you will get his special to land more often. But you will still be fighting his low health and protection and he will be one-shot fodder after that protection is stripped so bring along RG and bring along a healer. He will do better here than in arena but he’s not going to be a toon you will be rushing to bring along so he gets a four here. All told, Geonosian Spy in Star Wars: Galaxy of Heroes is a very disappointing character. We’re not offended by this the way we were with the old Anakin, but considering we just spent $150 for a disappointing character perhaps we should be. With low health, low protection, difficult to activate gimmicks (stealth/bonus damage) there’s just no real place in the game for him right now. On paper he looks exciting, but after tooling around with him for a few hours we can say we probably will not be using him in the game unless they put in a geonosian event, and probably neither will you. Scores are on a scale of 0 to ten. 0 Meaning don’t use. 10 meaning a very meta character that will be used often, and generally an 8 being maybe not your first choice but a solid one in certain circumstances. Also note this is a FIRST LOOK REVIEW these scores may change radically if a final review is posted. Thanks to user pcx99 for creating this review for the Geonosian Spy Review. What do you think of the Geonosian Spy in Star Wars: Galaxy of Heroes? Is he good or bad? Do you have any suggestions or feedback? Please feel free to leave a comment below. 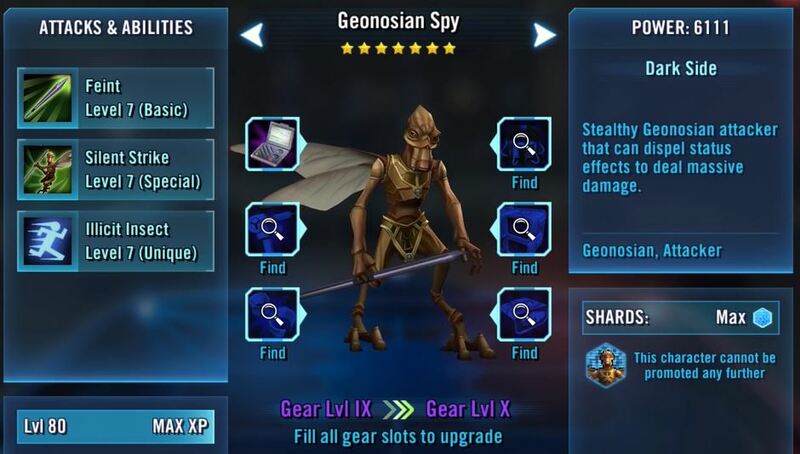 Be the first to comment on "Geonosian Spy Review – Star Wars: Galaxy of Heroes"